While rearranging my cluttered closet to get to my comics, I finally found the box with the 1990’s Black Lightning series by Tony Isabella (Jefferson’s creator) and Eddy Newell. It may have been brief, but damn was it sweet. Instead of going right to sleep, I reread issues one through three and it was like magic all over again. The fact that this run ended so early still irks me because a longer run would’ve cemented more of BL’s status quo here and the recent retcons would’ve been a lot less likely. I want to give this run a post of it’s own one day, but I’m posting because I just found out that Eddy Newell has a site again after thinking it had disappeared from the ‘net. That’s one huge upgrade! I’ll have to peep that out when I’m not working on something because I truly need time to browse. I’m joining that board, too! Evorgleb from Highbrid Nation (which I just had to add to the Blogroll) inspired some rare envy in me by linking to a great interview he had with Mele Mel of the Furious Five. As always, Mele Mel had some important points about the current state of Hip-Hop. He also dropped a few jewels on crowd psychology and other seemingly-lost arts of Hip-Hop performances. That interview is further proof that the group deserves to be the first Hip-Hop group in the Rock ‘n Roll Hall of Fame. Gotta get back to the artwork. Later! Thanks for the link. I’ll have to return the favor. 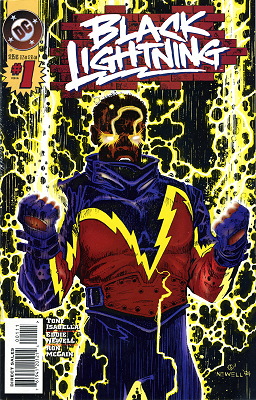 And how bout I never knew Black Lightning had a series! And I thought I was a bit of a comic expert. Nice job of bringing some attention to a character most people don’t even know. No prob about the link. I have to read through the older entires after I get this short comic story finished. A quick flip through the latest posts already has me more up to date than I’ve been in a hot minute. A lot of people didn’t know that he had his own book in the 90’s. The owner of the comic shop I went to showed me DC’s early preview version. It was raw even though it was just in pencil! It’s a comic run that’s worth hunting down.